“Auger” takes its title from Shell’s first deepwater play in the Gulf of Mexico (in partnership with BP)—drilling in 2,860 feet of water to a depth of 19,360 feet—in the mid-1990s. (With Deepwater Horizon, BP ultimately would drill in 4,000 feet of water to a depth of 35,055 feet. As I write, new wells are being readied in the ultra-deepwater.) 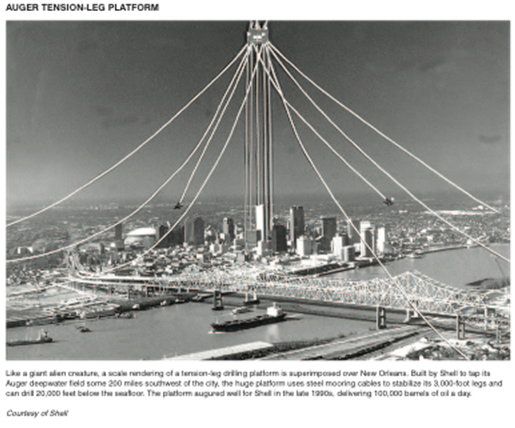 The first image, from the National Commission on the BP Deepwater Horizon Oil Spill and Offshore Drilling Report to the President, shows a scale rendering of the tension-leg drilling platform used at Auger, superimposed over the city of New Orleans. 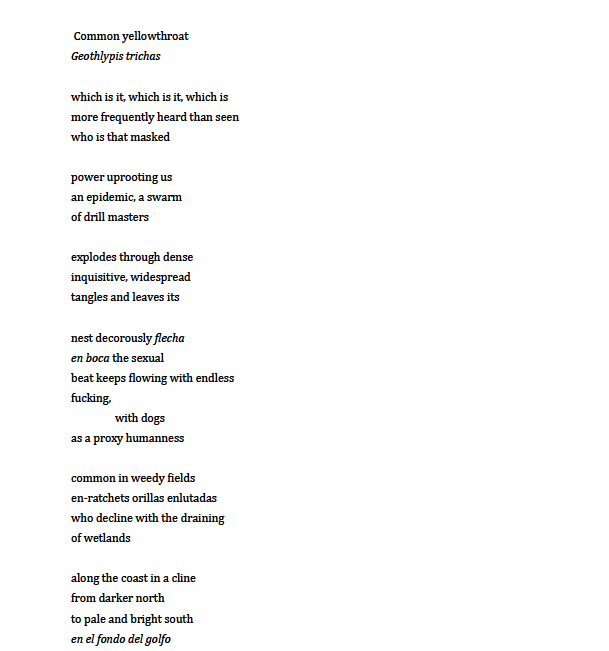 Superimposing a transparency of the scale platform image on the poem, I bored a hole through the “Great Ocean” sequence of Pablo Neruda’s Canto General, as translated by Howard Schwartz – taking out a half inch right down the middle of each page. The words I had bored became the poem, “Auger.” Estimated at about 1,300 lines, the poem when assembled stretches 26 feet across my floor, a .13 to 100 scale rendering of the Augur well. In drilling Neruda, I hoped to hit pay at a certain depth. I am still trying to understand what it means to drill through that much water, that deep in the ground. 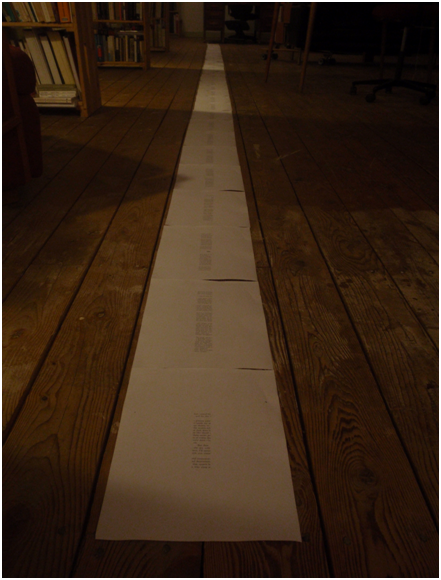 I wanted to experience the pressure of the long poem, in a compressed period. And to communicate scale. When I meet with Representative Chellie Pingree, to discuss Representative Ed Markey’s bill, HR 501: Implementing the Recommendations of the BP Oil Spill Commission Act, I’d like to read her a bit of “Augur.” I also want to thank her for the House Sustainability Coalition, which she founded and chairs. And I hope to entrust her with a bit of human scale. The report is good reading—even if you think you know everything about the so-called “spill.” You don’t. It is as interesting for what it doesn’t say as for what it does. I asked for documentation of the experiment, including failures as much as success. 36 contributors sent 130 pages of astonishing, thought-provoking material—essays, poems, dialogues, field reports, photoworks, digital art—which I have edited, as my contribution to the forthcoming issue of Interim Magazine. (I’ll also present Rep. Pingree with a copy of this work.) A personal visit, they say, is worth a thousand letters, a poem worth a thousand pictures. A poem is also for remembering. If not for yourself, then for the Common yellowthroat. Jonathan Skinner founded and edits the journal ecopoetics (www.ecopoetics.org). Skinner also writes ecocriticism on contemporary poetry and poetics. Skinner’s poetry collections include Birds of Tifft (BlazeVox, 2011), Warblers (Albion Books, 2010), With Naked Foot (Little Scratch Pad Press, 2009), and Political Cactus Poems (Palm Press, 2005). He teaches Environmental Studies at Bates College. 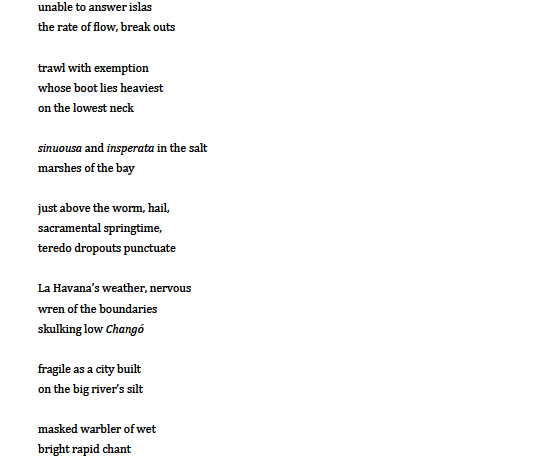 This entry was posted in Coastal Poems. Bookmark the permalink.